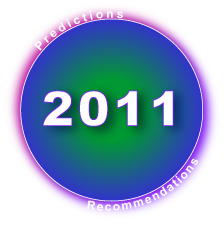 Web 3.0 and Social Business—2011 Predictions and Recommendations describes a turning point, away from social media to social business. SocialTech Grows Up—Relationship the Foundation of Business Success—Digital Clodhoppers Become Sore Thumbs. 2011 will mark a turning point in the adoption of digital social technologies because the experimentation phase is drawing to a close, and stakeholder expectations are increasing. Organizations and people will no longer gain attention by executing badly. At the enterprise level, participation will wane in venues and initiatives that have no business strategy, focus, content strategy and commitment. Paying inexperienced people or agencies to “share” snappy content will expose brands as digital clodhoppers and push customers away. Individuals will also have to improve their game and focus on the most relevant people in their networks. Stop sending default invitations on LinkedIn. Proactively support people whom you respect and trust the most. The theme is determining and executing on strategy, focus and commitment. Compared to its progenitors 2009 and 2008, 2010 was a relatively calm year because the amplitude of market gyrations was clearly less, and businesses began to find a new floor on which to build stakeholder expectations. Although I watched with high interest the unfolding drama in Europe, I didn’t have the time to conduct the research necessary to do a rigorous interpretation. I did publish a reflection in January, which is not included in this year in review. However, 2010 marked a major turning point in the adoption of social technologies: the recognition that analysis and strategy were necessary to achieve consistent results with social initiatives.